SINCO - Astronomia nova: Sun rotates around its axis? Home / News / Astronomia nova: Sun rotates around its axis? Astronomia nova: Sun rotates around its axis? 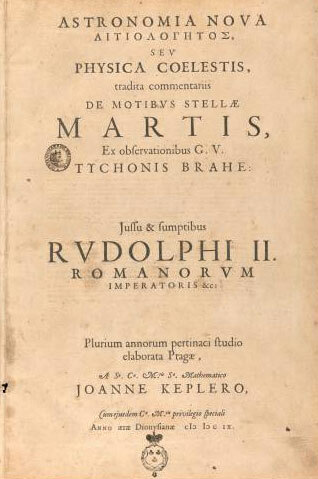 Astronomia nova is the astronomical treatise by Johannes Kepler published in 1609. The book contains the results of its long-term research of the planet Mars. Her full name is translated "New Astronomy, based on causes, or Celestial Physics, already addressed by commenting on the motion of stars Mars, based on observations of Tycho Brahe." In 1600 Kepler went from Graz, where he was persecuted for his religious beliefs and for his Copernican ideas. At the invitation of Danish astronomer Tycho Brahe moved to Prague, where he became his assistant. Their relations have been strained since Brahe believed Copernicus's heliocentric theory. He believed that the Earth is in the middle, while the other planets revolved around the sun. The planets orbit around the sun in an elliptical path, in which one common focal point is the sun. Content areas circumscribed vector planet at the same time interval are the same size. These laws Kepler first published in the book Astronomia Nova 1609. In this book, as well as first speculated that the Sun rotates around its axis.